At bandv, we have a proud reputation of running bold and creative marketing campaigns on behalf of for-profit and nonprofit companies alike. We especially love it when we get to work on something that’s truly beneficial for the world, so we were really excited to take the reins on a project on child lift safety for the Lift and Escalator Industry Association (LEIA). 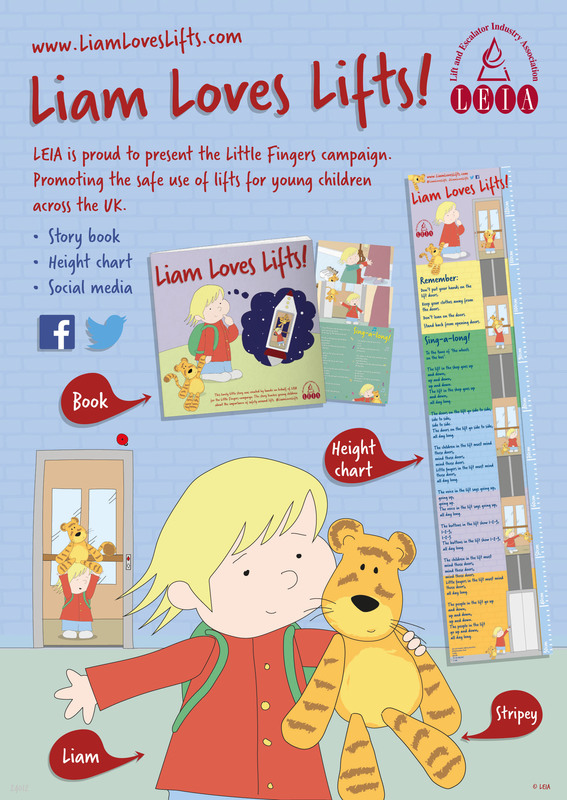 The campaign, which we entitled Little Fingers, saw us publish a children’s story book (Liam Loves Lifts), a height chart and a song. And the kids loved it! LEIA wanted to raise awareness about the importance of lift safety for children and enlisted the help of bandv to plan and execute the entire campaign. 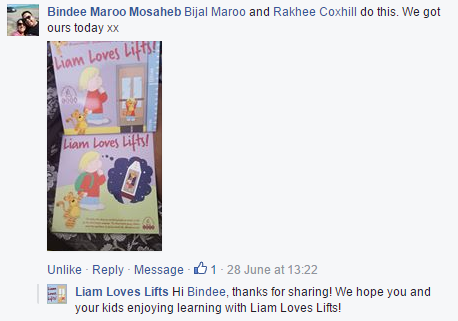 As a solution, bandv aimed to create amusing, child-friendly content to help children learn all about lift safety in an enjoyable, engaging way. The idea for the story book, song and height chart was the result of brainstorming sessions. These seemed to be the ideal formats for kids to engage with and learn from. Bandv company director Angela set about writing the story of little Liam, who loves lifts, and his cuddly toy tiger Stripey, who gets his tail caught in a lift door and has to be saved by an engineer. With repetition and alliteration throughout, the story’s target market was kids who enjoy reading on their own as well as those who love being read to by their parents. 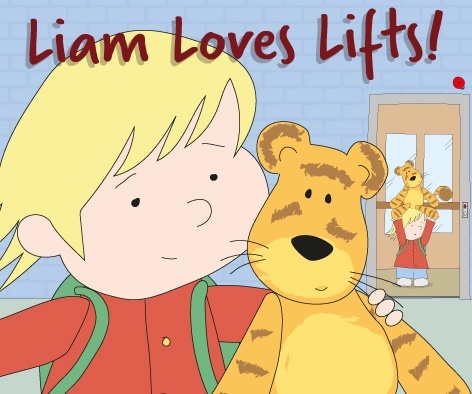 Angela also came up with the lyrics to the accompanying song, sung to the tune of ‘The Wheels on the Bus’, which was intended as a catchy way for kids to get to grips with lift safety. Our designer, Sally, turned our abstract ideas into reality, invoking the style of popular children’s illustrator Stephen Cartwright for the pictures. 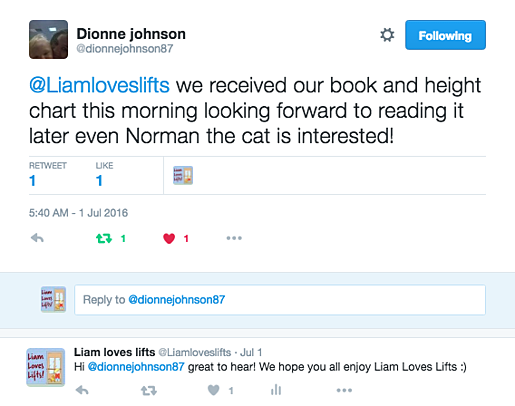 Sally created both the book and height chart in a fun, distinctive style that would also form the basis for the social media header images and profile pictures. Sally also created a pull-up display for the Liftex exhibition, a leaflet, banner ads for use on popular parenting websites Mumsnet and Netmums to promote the campaign, plus an email footer to thank people for ordering or downloading their copies. 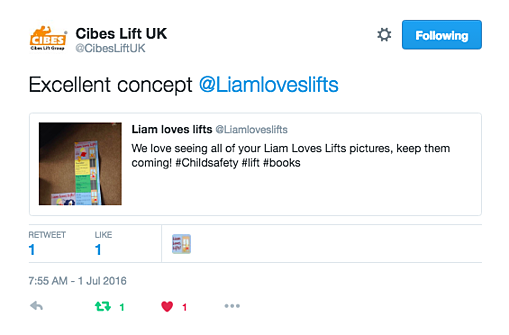 LEIA launched the book on 25th May, to coincide with Liftex 2016. We made the book and height chart available both by download (to print at home) and by order via the LEIA website. 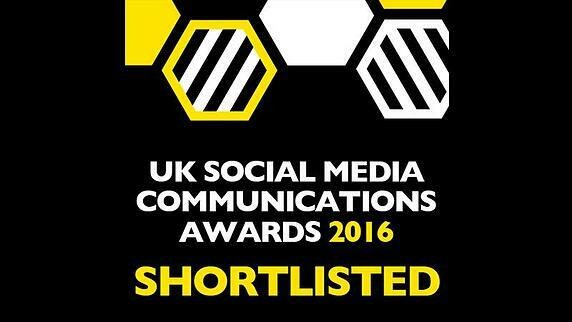 We created Facebook and Twitter pages to spread the word, with Facebook being by far the best performing channel. We used posts directed to the landing page on LEIA’s website, occasionally boosting them on Facebook to target women aged 28-40 with relevant interests such as parenting, motherhood and preschool. Facebook and Twitter also acted as two-way communication channels, with people asking questions, sharing their thoughts and thanking us for their freebies! Bandv's social media marketer Rachel corresponded with them. The campaign has been a big success. Our weekly Facebook reach is around 30,000 people, with an average of 700 post engagements and 150 page views per week. In just over a month of running, we have surpassed 1,000 orders and downloads, with schools and nurseries reaching out to us directly to order multiple copies — with one school ordering 250! On top of this, we have just ordered 2,000 more sets to be printed to meet demand for the remaining two months of the campaign.